Providing insight into the future of smartphone technology — and taking a jab at Apple — Qualcomm President Cristiano Amon said that by the end of 2019, all Android handset makers will have at least one flagship device capable of accessing speedy 5G networks. Apple's iPhone is not expected to make the leap to 5G until 2020. Qualcomm President Cristiano Amon discusses 5G at the Snapdragon Technology Summit. | Source: CNET's Shara Tibken via Twitter. With Qualcomm being the sole provider of baseband chipsets to most major Android manufacturers, Amon's statement is less a prediction than it is a promise. Specific release dates and details were left unmentioned, but a slide presented during Amon's keynote listed a number of major firms who are partnering with Qualcomm on the 5G rollout initiative. Those companies include Asus, Fujitsu, Google, HMD, HTC, InSeeGo, LG, Motorola, Netgear, NetComm Wireless, OnePlus, Oppo, Samsung, Sharp, Sierra Wireless, Sony, Telit, Vivo, WingTech, WNC, Mi and ZTE. Hammering home the notion that 5G is knocking on consumers' doors, Samsung at the event showed off prototype devices running on hyper-local 5G networks set up by AT&T and Verizon. The "proof of concept" phones were powered by Qualcomm guts including Snapdragon X50 5G NR modem and antenna modules, an integrated RF transceiver and other components from the Snapdragon Mobile Platform. Apple, and any mention of iPhone, was conspicuously absent at the event. The Cupertino tech giant is embroiled in a bitter legal battle with its former supplier, and has since turned to Intel to meet its cellular modem needs. In November, and again this week, reports claimed a 5G-capable iPhone will debut in 2020. That puts Apple's timeline more than year behind Android vendors that plan to first integrate the technology in early 2019. That said, Apple is typically slow to adopt the fastest cellular standards. The first iPhone, for example, launched without support for the then-cutting-edge 3G standard, while 4G LTE integration arrived much later than competitors when iPhone 5 received support in 2012. While missing out on "first to market" claims, Apple's launch plans should ramp well with a buildout of supporting infrastructure. Carriers like Verizon, AT&T and Sprint are in the early stages of seeding their respective networks with compatible base stations, and widespread availability is not expected until at least 2020. 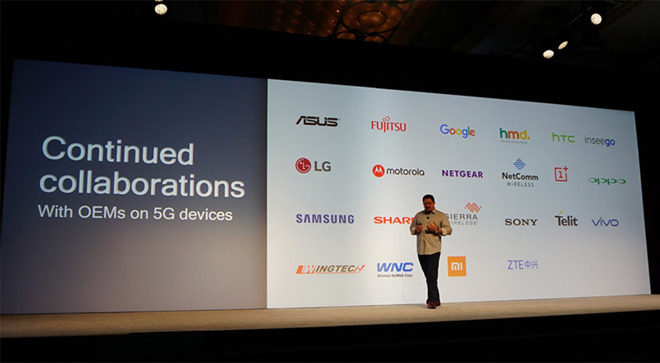 Amon at Tuesday's event highlighted Qualcomm's 5G working partners, which include the three major U.S. carriers and international players like China Mobile. Still, the road to 5G will be slow going. At the event, AT&T senior vice president Kevin Petersen said the percentage of devices with 5G capabilities in the U.S. in 2019 will be in the "low single digits," the report said.